• Oxidative damage can generate dysfunctional HDL reducing its anti-atherogenic role. • Increased MetO levels in ApoA-I in patients with premature MI and in type 2 DM. • An increase in MetO levels in ApoA-I could result in HDL dysfunction. ApoA-I can undergo oxidative changes that reduce anti-atherogenic role of HDL. The aim of this study was to seek any significant differences in methionine sulfoxide (MetO) content in the ApoA-I of HDL isolated from young patients with coronary heart disease (CHD), type 2 diabetics and healthy subjects. We evaluated the lipid profile of 21 type 2 diabetic patients, 23 young patients with premature MI and 21 healthy volunteers; we determined in all patients the MetO content of ApoA-I in by MALDI/TOF/TOF technique. The typical MALDI spectra of the tryptic digest obtained from HDL plasma fractions all patients showed a relative abundance of peptides containing Met112O in ApoA-I in type 2 diabetic and CHD patients. This relative abundance is given as percentages of oxidized ApoA-I (OxApoA-I). OxApoA-I showed no significant correlations with lipoproteins in all patients studied, while a strong correlation emerged between the duration of diabetic disease and OxApoA-I levels in type 2 diabetic patients. The most remarkable finding of our study lies in the evidence it produced of an increased HDL oxidation in patients highly susceptible to CHD. Levels of MetO residues in plasma ApoA-I, measured using an accurate, specific method, should be investigated and considered in prospective future studies to assess their role in CHD. No more than 25% of the risk of coronary heart disease (CHD) can be explained by known risk factors, despite their high prevalence . High-density lipoprotein (HDL) protects artery wall from atherosclerosis, in particular they remove excess cholesterol from artery wall macrophages and carries it back to the liver for excretion in bile . Apolipoprotein A-I (ApoA-I) is the main protein of HDL and it plays a crucial part in the first cholesterol transport reversal step by enhancing sterol efflux from macrophages . Epidemiological studies have demonstrated that plasma HDL independently predict the risk of developing atherosclerosis and cardiovascular disease . More recently, however, it has emerged that HDL quality also seems to be an important parameter in atheroprotection, though there is little data in the literature to support it . An increasing body of evidence shows that HDL isolated from atheromas and the plasma of patients with established CHD lacks these anti-atherogenic properties . HDL can be functionally deficient in populations at high risk of CHD, as in type 2 diabetes mellitus, due to glycation and oxidative changes in their HDL, apolipoproteins, and/or enzymes. ApoA-I in particular can undergo oxidative changes that reduce its anti-atherogenic role. Oxidation of the Tyr and Met residues in ApoA-I by myeloperoxidase drastically impairs the protein’s ability to promote cholesterol efflux via the ABCA1 pathway . Levine and colleagues  suggested that Met residues in protein serve as endogenous antioxidants, protecting functionally important amino acids against oxidation. In ApoA-I in particular, Met86 and Met112 are thought to be important for cholesterol efflux, and Met148is believed to be involved in LCAT activation . Brock et al. recently examined the extent and sites of methionine sulfoxide (MetO) formation in the ApoA-I of HDL isolated from the plasma of healthy controls and type 1 diabetic subjects, demonstrating that MetO formation was significantly greater in diabetic patients than in a control group at all three sites considered (Met86, Met112, and Met148). Considering the relevant role of HDL oxidation in the onset of atherosclerotic processes, we ran a pilot study on a small group of type 2 diabetic patients and young people prematurely experiencing acute myocardial infarction (MI): in both these groups we found higher levels of Met112O than in healthy controls . That investigation was carried out by microfluidic-LC/ESI-MS measurements. In a further study the determination of MetO content of ApoA-I in type 2 diabetic patients was performed by MALDI/MS  and the results obtained perfectly overlap those achieved in the previous LC/MS investigation. These results proved that possible oxidation phenomena, sometimes observed in MALDI conditions , are in this case absent. The aim of this study was to assess larger study groups to seek any significant differences in MetO between patients with premature MI, type 2 diabetics and healthy subjects, and to identify any correlations with these individuals’ lipoproteins. A secondary aim was to see whether the duration of the diabetic patients’ disease correlated with HDL oxidation. MALDI/time of flight (TOF) and MALDI/TOF/TOF measurements were performed using a MALDI/TOF/TOF UltrafleXtreme instrument (Bruker Daltonics, Bremen, Germany), equipped with a 1 kHz smartbeam II laser (λ = 355 nm) and operating in the positive reflectron ion mode. The instrumental conditions were: IS1 = 25 kV; IS2 = 21.65 kV; reflectron potential = 26.3 kV; delay time = 0 nsec. The matrix was α-cyano-4-hydroxycinnamic acid (HCCA) (saturated solution in H2O/acetonitrile (50:50; v/v) containing 0.1% TFA). Five μL of purified tryptic digest and 5 μL of matrix solution were mixed together, then 1 μL of the resulting mixture was deposited on the stainless steel sample holder and allowed to dry before placing it in the mass spectrometer. External mass calibration (Peptide Calibration Standard) was based on monoisotopic values of [M+H]+ of angiotensin II, angiotensin I, substance P, bombesin, ACTH clip , , , ,, , , , , , , , , , ,  and , ACTH clip (18–39), somatostatin 28 at m/z 1046.5420, 1296.6853, 1347.7361, 1619.8230, 2093.0868, 2465.1990 and 3147.4714. TOF/TOF experiments were performed using the LIFT device in the following experimental conditions: IS1: 7.5 kV; IS2: 6.75 kV; Lift1: 19 kV; Lift2: 3.7 kV; Reflector1: 29.5 kV; delay time: 70 ns. Table 1 shows the demographic and clinical characteristics of patients and controls. The three groups were matched for age and smoke; the controls and diabetics were also matched for gender, while the premature MI group consisted almost entirely of men, with only one female patient. Type 2 diabetic patients were not in a situation of good metabolic control, their HbA1c levels being a mean 8.22 ± 0.84% and their FPG 156.7 ± 29.7 mg/dl. Table 1.Clinical characteristics of type 2 diabetic patients, young patients with premature CHD and controls. Data are expressed as mean ± standard deviation. To assess statistical differences between groups, ANOVA followed by Tukey’spost-hoc test was used. ●●● p < 0.001; ●● p < 0.01; ● p < 0.05; ns: not significant;–:not applied. Abbreviations: FPG = fasting plasma glucose; TC = total cholesterol; LDL = low-density lipoprotein; HDL = high-density lipoprotein; OxApoAI = oxidized Apolipoprotein AI; MI = myocardial infarction. The three groups had similar total cholesterol levels. The group of patients with a premature MI had the highest levels of LDL cholesterol and the lowest levels of HDL cholesterol. Their triglycerides were also higher than in the healthy controls, but lower than in the diabetic patients. 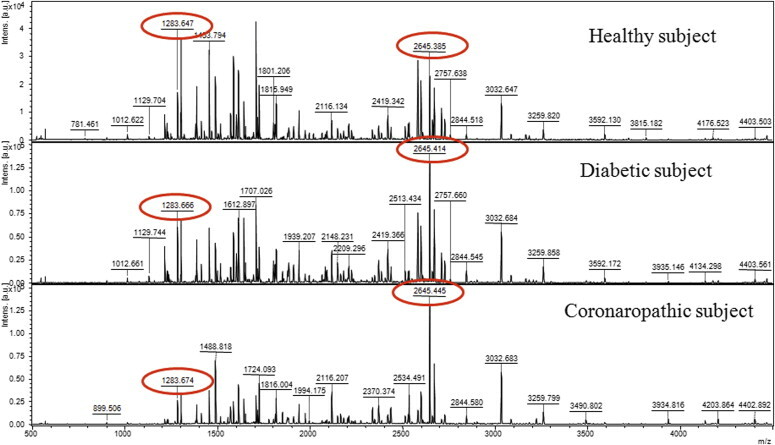 The typical MALDI spectra of the tryptic digest obtained from HDL plasma fractions of healthy subjects, diabetics and CHD patients are given in Fig. 1. MS/MS experiments performed on the two ions at m/z 1283.6 and 2645.4 showed that the sequences of the corresponding peptides are W108QEEM112ELYR and V97QPYLDDFQKKWQEEM112ELYR, both of which contain the methionine residue in position 112 (Met112). Looking at selected regions of the spectra related to the two above-mentioned ions, some differences appear between the healthy controls vs the diabetic patients and CHD patients. In the case of the diabetics and CHD patients, the two peaks at m/z 1299 and 2661 become more evident than those detected in the case of healthy subjects. These two peptides, differing from the above-described species by 16 Da, can be justified by the presence of the previously-mentioned peptides containing a Met112O moiety (see Fig. 2). MS/MS experiments performed on these two ions confirms this hypothesis, based on the presence of a fragment ion due to the loss of CH3SOH. This result confirms that oxidation occurs at Met112 in both the peptides. The above-described relative abundance of peptides containing Met112O- and Met112 was ascertained for all samples. The percentages of OxApoA-I were calculated dividing the sum of the abundances of the peaks at m/z 1299 and 2661 (originating from oxidation of Met112) to the sum of the abundances of the four peaks of interest: the results so obtained are shown in Table 1. Both the diabetic and the CHD patients showed significantly higher OxApoA-I levels than controls. 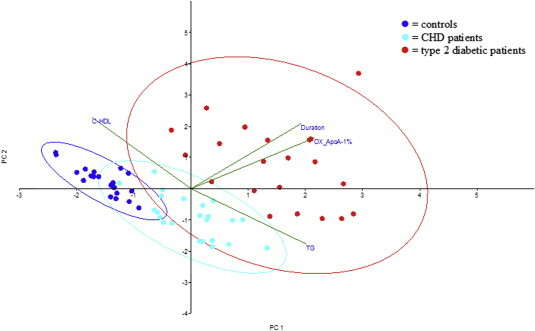 We did not observe any significant correlation between the levels of ApoA-I and OxApoA-I in all groups (controls: r = −0.031; diabetics: r = 0.092; CHD patients: r = 0.20, respectively). The typical MALDI spectra of the tryptic digest obtained from HDL plasma fractions of healthy subjects, diabetic and CHD patients. 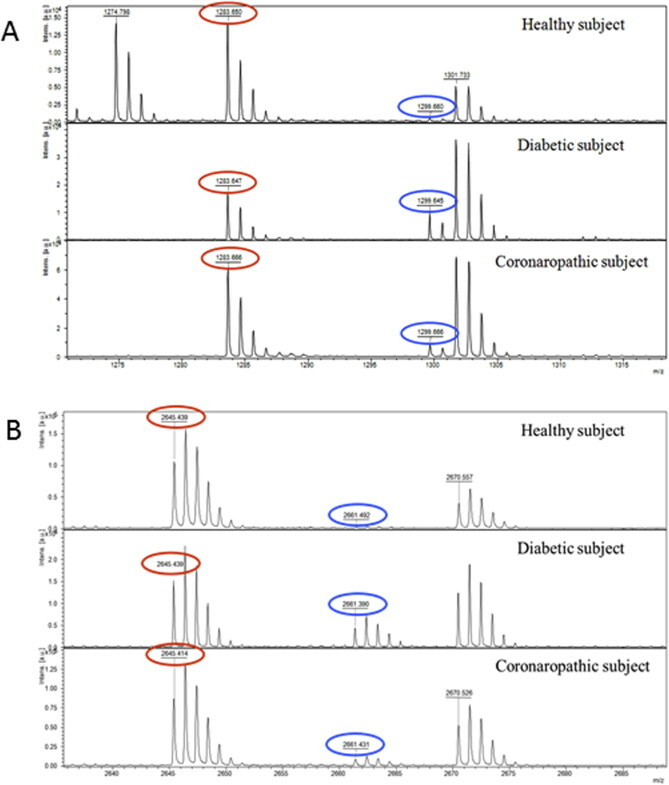 Expanded view (A: m/z 1283–1299; B: m/z 2635–2690) of the MALDI mass spectra of tryptic digests from healthy subjects, diabetic patients and CHD patients. It is to underline that the possible ex-vivo oxidation of methionine residue was checked analyzing the lyophilized HDL samples after two and four months of storage at −30 °C. No significant variation in the content of Met112O was observed, indicating that ex-vivo oxidation is inhibited at storage temperature. OxApoA-I showed no significant correlations with lipoproteins, while there were inverse significant correlations between HDL cholesterol and triglycerides in both the diabetic and the CHD patients (p < 0.02), but not in the healthy controls, as shown in Table 2. No correlation emerged between the OxApoA-I and HbA1c levels in the diabetic patients (r = 0.0344). Table 2.Linear correlation between oxidized ApoA-I (Ox-ApoA-I) and serum cholesterol in the three groups of patients. Data are the Pearson product–moment correlation coefficient (Pearson’s r) with the lower and upper 95% confidence intervals (in parentheses). *p < 0.02. In order to evaluate with a more integrated approach the presence of interrelationships among variables, the non-parametric technique of PCA was considered. The analysis was extended to the three groups as a whole, in order to check any distribution among the individuals, and the respective role of the considered variables. As the biplot of Fig. 3shows, it was confirmed the previously found lack of any relationship between the OxApoA-I levels and HDL cholesterol or triglycerides, and it was confirmed also the presence of an inverse correlation between HDL cholesterol or triglycerides; moreover, from this analysis a strong direct correlation between the duration of diabetic disease and OxApoA-I levels emerged. Biplot of the first two principal components (PC1 and PC2) obtained by PCA conducted on the most representative variables from diabetic patients, CHD patients and controls. In the present, small cross-sectional study, our data analyses support the impression that the atheroprotective effect of HDL may be deficient in patients experiencing a premature MI and in cases of type 2 DM, both models of accelerated atherosclerosis . This HDL dysfunction could be due to an increase in MetO levels in ApoA-I. We demonstrated, not only that type 2 diabetic patients and young patients with premature acute MI share the same ApoA-I oxidation, but also and more importantly they both have a greater HDL oxidation than controls, irrespective of their HDL levels. This feature was recently observed in type 1 diabetic patients compared with healthy controls, and it may contribute to an accelerated atherosclerosis . These findings provide a new clinical perspective compared to preliminary results obtained by microfluidic-LC/ESI-MS , this time using an alternative technique (MALDI/MS), that makes the analysis far less time-consuming, as we previously showed in type 2 diabetic patients and healthy controls . Our group of type 2 diabetic patients showed no signs of CHD despite their more severely oxidized HDL. We surmise that they offset the higher levels of oxidized HDL with higher levels of HDL, so the ratio of HDL to oxidized HDL might be a better marker of CHD than low HDL levels. Unfortunately, since our method only allowed for a semiquantitative assessment of the oxidation of the above-described peptides, these data cannot be used to calculate the HDL/oxidized-HDL ratio. It is worth noting that no correlation emerged between MetO levels in ApoA-I and HbA1c, indicating that ApoA-I oxidation appears unrelated to the degree of glycemic control. This finding is in agreement with previous observations that have shown no correlation between glyco-oxidation products, such as glyoxal and methylglyoxal, which better represent the real glyco-oxidative stress experienced by patients . On the other hand, our data suggest that duration of disease might be the parameter most closely related to MetO levels in ApoA-I in type 2 diabetes. In this contest, the antioxidant system could play an important part in the onset of cardiovascular complications by counter-regulating the increased oxidative stress, as we found in various phenotypes of type 2 diabetic patients with and without micro- and macrovascular complications  and . Several studies have also demonstrated that decreased levels of antioxidants favor cardiovascular disease in subjects without diabetes . As regards our data on HDL oxidation, we hypothesized that the increase of Apo-AI oxidation could be due to the decreased levels of antioxidant defenses that characterized type 2 diabetic patients with long duration of disease and patient with premature MI. Recent observations, in fact, showed that serum myeloperoxidase/paraoxonase 1 ratio is a potential indicator of dysfunctional HDL and risk stratification in CHD . At the end HDL oxidation process could be partially independent from oxidative stress burden, but affected by decreased antioxidant capacity. As for the higher triglyceride levels found in our type 2 DM and CHD patients, we surmise that hypertriglyceridemia could be a prognostic marker even in young patients with premature MI, irrespective of other cardiovascular risk factors, as previously reported. Both our groups of patients showed a strong inverse relationship between their HDL and triglyceride levels, a situation typical of insulin resistance and found associated with MI occurring before 40 years of age . As regards LDL cholesterol, we found the highest level in young CHD patients who were all in statin therapy. Considering the very short period of statin therapy and knowing that to reach the full effect it needs at still a month, CHD patients showed LDL cholesterol levels not still at target. On the other side, statin therapy hardly have had an impact on the oxidation of HDL. In any case statin protective effect on the oxidation strengthen our conclusions. All these quantitative and qualitative lipoprotein features (higher oxidized HDL, higher triglycerides and lower HDL levels) suggest the feasibility of characterizing patients at high risk of CHD in terms of their lipid profile, as illustrated in the integrated biplot ofFig. 3. In conclusion, the most remarkable finding of our study lies in the evidence it produced of an increased HDL oxidation in patients highly susceptible to CHD. Levels of MetO residues in plasma ApoA-I, measured using an accurate, specific method, should be investigated and considered in prospective future studies in order to assess their possible role as a novel risk factor – and eventually as a therapeutic target – to reduce the burden of cardiovascular complications.